For the strength component we had deadlift. Scott Freedland set the tone early with 455# for the guys. 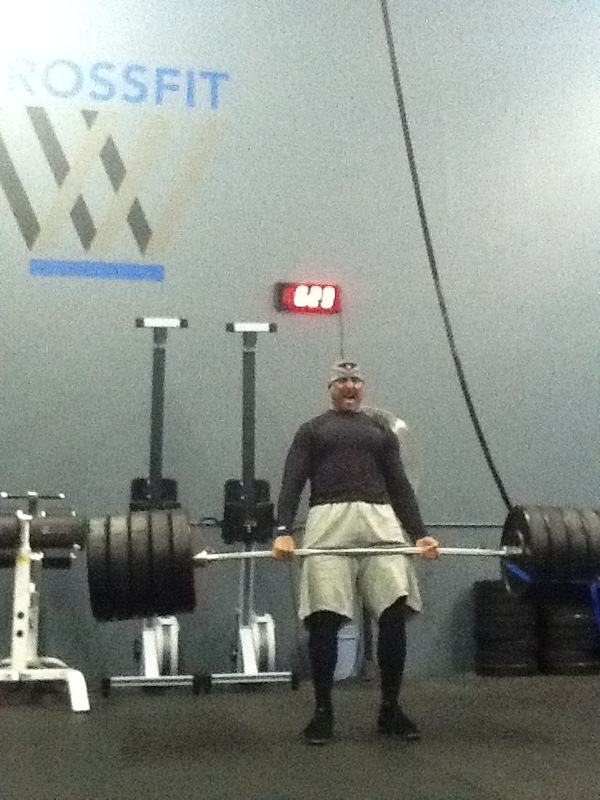 Not until the evening did Vinny Pizzo smash it with a monster lift of 495#s and a 30# PR. This is Vinny’s third week straight taking the top spot in at least one of the three tests. Phenomenal job, Vinny! On the ladies side, Cammi Merriam pulled a legit 215#s for a 40# PR (25% increase in strength) in the morning. That held all day until Michelle Panceroff and Yvette Mojarro stole the show with 235#s a piece. By the way, Michelle is 6 months pregnant. Good work ladies. Strong is beautiful! Moving on to the L-sit hold, Paula Halstead owned it. She beat all men and all women to take the top spot with an unbelievable 1:02. Her body was a perfect 90 degree angle the entire time. I know it’s not a secret at this point, but she never ceases to amaze me at 57 years young! Tommie Denson held his own with :36 to lead the charge for the fellas. As for the 1 mile TT, Dylan Merriam laid down a solid 5:57 that nobody came close to until the end of the night when Zac Marquez came out of nowhere to post a 5:47. Worthy! Shelly Vander Velde notched a 6:44 for the ladies and was the only women to get in the 6s. By the way, she PR’d on her deadlift by 25#s, too! Niiiice! Vinny it is obvious that all your hard work has truly paid off. Your an inspiration to me to be the best that I can be, in continuing to keep pushing myself every day. Everybody did great, 495 and 235 respectivly are sick deads! 1 min plus on l-sit is nuts! and sub 6 miles for the dudes, sub 7 for the lady on a knarly hill!